Tasty Tuesday – Birthday Cupcake Cake | Who Are You Calling Crafty? 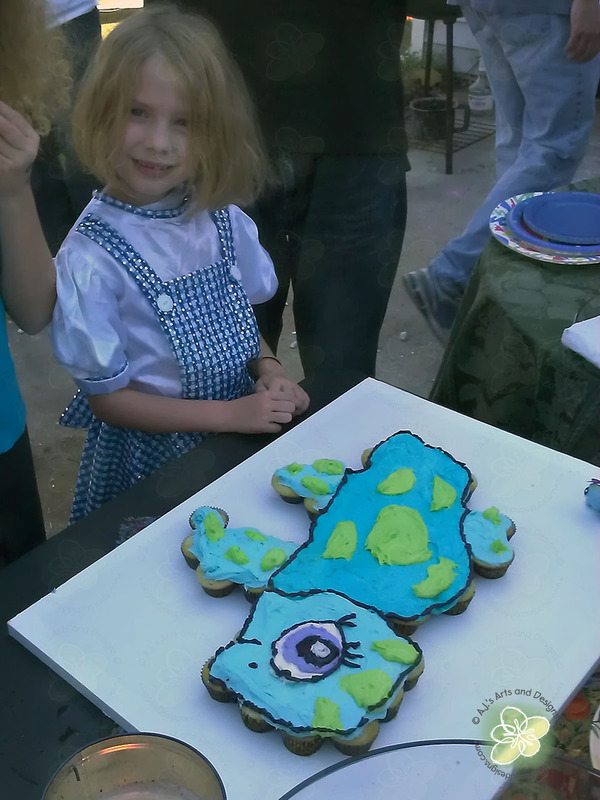 Saturday was the Princess’s Birthday Party the only thing she wanted was a Littlest Pet Shop Sea Turtle Cupcake Cake. I honestly had no idea what I was going to do for this cake I did have a ton of mini cupcakes (120) to use. Surprisingly it came together rather nicely, I arranged the mini cupcakes in the shape of a sea turtle and then started frosting it. I used my frosting gun from Wilton and then smooth everything with a frosting knife. I also piped the black frosting with a real piping bag (yep crazy). One of my friends watched me do it and she said I was crazy but it put a smile on the Princess’s face so it was worth it! The Princess and her cake! Also don’t forget to do your civic duty and VOTE!